We invoke the Holy Spirit using the words of St. Augustine.Come, Holy Spirit, by whom every devout soul, who believes in Christ, is sanctified to become a citizen of the City of God! (en. Ps. 45:8) Come, Holy Spirit, grant that we receive the motions of God, put in us your flame, enlighten us and raise us up to God (s. 128,4). On the first day of the week, Mary of Magdala came to the tomb early in the morning while it was still dark, and saw the stone removed from the tomb. So she ran and went to Simon Peter and to the other disciple whom Jesus loved, and told them, “They have taken the Lord from the tomb, and we don’t know where they put him.” So Peter and the other disciple went out and came to the tomb. They both ran, but the other disciple ran faster than Peter and arrived at the tomb first; he bent down and saw the burial cloths there, but did not go in. When Simon Peter arrived after him, he went into the tomb and saw the burial cloths there, and the cloth that had covered his head, not with the burial cloths but rolled up in a separate place. Then the other disciple also went in, the one who had arrived at the tomb first, and he saw and believed. For they did not yet understand the Scripture that he had to rise from the dead. Let us now meditate with the commentary of St. Augustine on these words of the Gospel according to St. John. On the first day of the week, early in the morning while it was still dark, Mary Magdalene came to the tomb and saw the stone removed from the tomb. It is because of the resurrection of the Lord that Christian custom has called the first day of the week Dies Dominica, the Day of the Lord. Mary Magdalene, thus, ran and went to Simon Peter and to the other disciple, whom Jesus loved, and told them: ‘They have taken the Lord from the tomb, and we don’t know where they put him.’ Some codices, including Greek ones, have: “They have taken my Lord,” which seems to be said because of very intense affection of love or servitude; but in the majority of the codices I had at my disposal, I have not found this…. Thus Peter and the other disciple went out and arrived at the tomb. 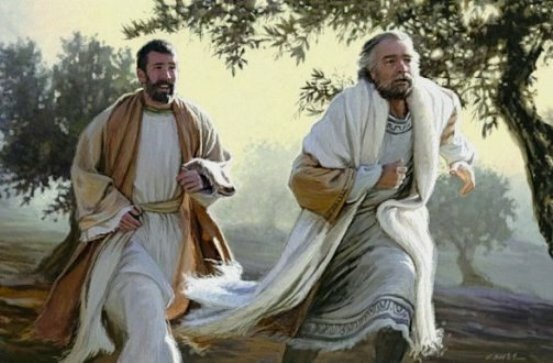 The two ran together but the other disciple ran ahead faster than Peter and arrived first at the tomb. Here one must take note and evaluate the recapitulation: how he goes back to something he overlooked and, nevertheless, as though this would follow, has been added. Thus, even though he had already said: “They arrived at the tomb,” he stepped back to narrate how they arrived… He affirms: And as the beloved disciple bent, he saw in place the linens; nevertheless, he did not enter. Then Peter arrives after him, and entered the tomb and saw the linens in place and the sudarium which had covered the head, not placed with the cloths, but separately rolled in a place. Do we suppose that these data are without significance? No way can I think it this way. But I press on towards other things in which the need of some problem or obscurity might force me to delay…. Then, that disciple who had arrived first at the tomb also entered. He arrived first, but he entered last. Evidently neither is this useless, but I have no time for it. And he affirms: he saw and believed. Some, for being little attentive, suppose that here John had believed this: that Jesus has risen; but what follows does not indicate this. Then, what is the meaning of what he has immediately added: that they had not yet known the Scripture: that it is necessary that he rise from the dead? Therefore, he did not believe that he had risen, for he still did not know that it is necessary that he resurrect. What then did he see and what did he believe? For sure he saw the empty tomb and, since they did not yet know the Scripture that it is necessary that he rise from the dead, he believed what the woman had said: that they had taken him away from the tomb. Therefore, when they heard the Lord say it in person, even though he said it very clearly, since usually they heard his parables and they did not understand, they believed that he was alluding to another thing (Io. eu. tr. 120, 6. 4. 9). “On the first day of the week, early in the morning, while it was still dark, Mary Magdalene came to the tomb” (Jn. 20:1). Why do you believe that Mary Magdalene came very early to the tomb? Where were the other disciples at the dawn of the first day of the week? “He saw and believed; for he did not yet understand the Scripture that Jesus had to rise from the dead” (Jn. 20:9). How can you apply in your life the two verbs “see” and “believe”? What importance does the Sacred Scripture have in your life? Contemplate Mary Magdalene and her surprise before the empty tomb. Contemplate how she runs. Experience with her the joy of the resurrection, contemplate the risen Christ who has come out of the tomb. Contemplate the empty tomb of Christ. Enter it with the beloved disciple and Peter, observe what is in it and live the joy of the Easter morning. Turning towards the Lord: Lord God, Father Almighty, with pure heart, as far as our littleness permits, allow us to give you our most devoted and sincere thanks, begging with all our strength from your particular goodness, that by your power you may drive away the enemy from all our thoughts and actions; that you may increase our faith, govern our mind, give us spiritual thoughts, and bring us to your happiness, through your Son Jesus Christ, our Lord, who with you lives and reigns, in the unity of the Holy Spirit, God, forever and ever. Amen (en. Ps. 150:8).